The Fifth Book of Peace opens as Maxine Hong Kingston, driving home from her fathers funeral in the early 1990s, discovers that her neighborhood in the Oakland-Berkeley hills is engulfed in flames. Her home burns to the ground, and with it, all her earthly possessions, including her novel-in-progress. Kingston, who at the time was deeply disturbed by the Persian Gulf War, decides that she must understand her own loss of all she possessed as a kind of shadow-experience of war: a lesson about what it would be like to experience up close its utter devastation. Thus she embarks on a mission to re-create her novel from scratch, to rebuild her life, and to reach out to veterans of war and share with them her views as a lover of peace. In the middle section of this remarkable book, Kingston reconstructs for us her lost novel, the lush and compelling story of the Chinese-American Wittman Ah Sing and his wife, Taaâ€”California artists who flee to Hawaii to evade the draft during the Vietnam War. Wittman and Taa help to create an official Sanctuary for deserters and GIs whove returned devastated by their experiences in Vietnamnot unlike, as it turns out, the metaphorical sanctuary Maxine creates, back in her real world, by inviting war veterans to participate in writing workshops. As the vets share their stories, she teaches them both the value of writingthe accurate transcription of what is in the heartand the value of community. Paradoxically, the stories of war and its terrors become for her and the vets a literature of peacewords that enable them to achieve peace, at least within themselves. Moving among the vets with her Buddhist-inflected wisdom and at times humorous self-doubts, weaving their stories together with her own struggle to reorient herself after the fire, Maxine Hong Kingston is at times a kind of sprite, an almost weightless spirit, who guides others toward a better place, and at times a challenging teacher, who will not let us turn from the spectacle of a world so often at war. "A trenchant opus about surviving the fires of life. . .a wonderful, mulitlayered work. Marvelous." "[Kingston's prose] is masterly, at times nearly overwhelming in its descriptive power... The world--and not just the world of literature—owes Maxine Hong Kingston a huge debt of gratitude." "Gorgeous. [A] work of love and powerstraight from Kingston's brilliant and passionate heartand her vision of peace is undeniable. You have to see it, too." "A moving testament to Kingston's determination and compassion, and a document of how one can survive pain, loss and the burden of history." "A strange, scarred thing, pieced together from fragments, smelling of smoke and anguish. Its power lies in its pain." "Rich in empathy and moral conviction. Kingston is an exuberant storyteller." "Astonishing...Part fiction and part autobiography, revery, prophecy, and how to manual...Wherever we are in this fifth book... Kingston is a lotus, a flowering of divine intellect, and a bodhisattva, sticking around, one birth short of nirvana, to ease our suffering." "A sharp, aching account. . . . [It] captivates . . . because of the splashy urgency of its writing." "Kaleidoscopic . . . Mesmerizing. . . . Employing language that is a lush and vibrant lure skimming the still lake of our collective experience as Americans who have attended far too many wars in far too few years, Kingston reels in the big questions . . . and displays them with both authority and care. The Fifth Book of Peace is a big book, chock full of real, not self, importance." "Powerful. . . . Kingstons elegant arc from the person to the global constitutes a profound act of humility and compassion." "A passionate plea that draws on U.S. history and Buddhist wisdom to argue for an all-inclusive and peaceful world." "Moving. . . . A richly various extended meditation on peace. . . . 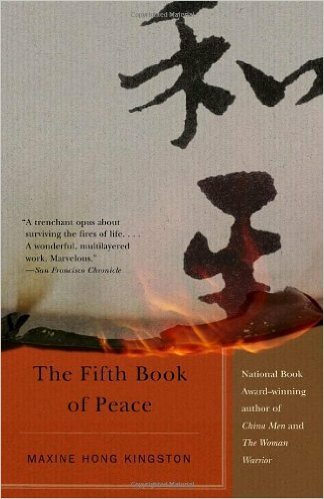 The lesson embodied in The Fifth Book of Peace could not be more timely." "An amazing testament to the existence of peace, even in the midst of war. The book is a communal effort, beautifully orchestrated by Hong Kingston and pieced together with open eyes. She doesn't romanticize, doesnt ignore the failures of past peace movements, but bravely searches for new possibilities." "Beautifully rendered. . . . Intelligent and poetic. . . . Kingston gives readers entr?e into something powerful." "Dense, complex, urgent. . . . Kingston is interested here in the process of telling stories to come to a happy ending." "Immediately striking about The Fifth Book of Peace is the uncanniness with which it nails the anxiety of this nation. . . . Kingstons stories and practicesand particularly her characters, both real and imaginedhave a refreshing authenticity." "Intense, often moving. . . . [Kingston] lays down layers of meaning, deftly weaving symbolism and imagery. --The Miami Herald An arresting tour de force. . . . This is surely a better book than the one [Kingston] lost." "[An] uncompromising examination of the meanings of peace. . . . Secrets and truths that lesser writers would take to their graves, [Kingston] delivers with startling openness. . . . She has gathered a community of the lost, the disempowered, the people who never get to write alternative histories, and gifted them the fierce power of her voice." "Her recounting of the fire is astonishing. She has a poets eye for description. . . . Kingston has . . . create[d] something good out of painful memories." "Powerful. . . . Thoughtful and passionate." "Gripping. . . . [Filled] with bracing honesty. . . . Kingston has written a moving, urgent book that discounts facile notions of peace as a passive state." "Satisfying. . . . Surreal, vivid detail." "Brilliantly imaginative. . . . Fine writing and intriguing stories. . . . As always, Kingston is a superb stylist."